ENTER TO WIN A 2020 TRIP TO THE PREMIER PRIVATE WATER FLY FISHING DESTINATION IN COLORADO! FULL DAY GUIDED FLY FISHING TRIP FOR TWO TO BOXWOOD GULCH WITH 5280 ANGLER GUIDE SERVICE. NO FLY FISHING EXPERIENCE NECESSARY. 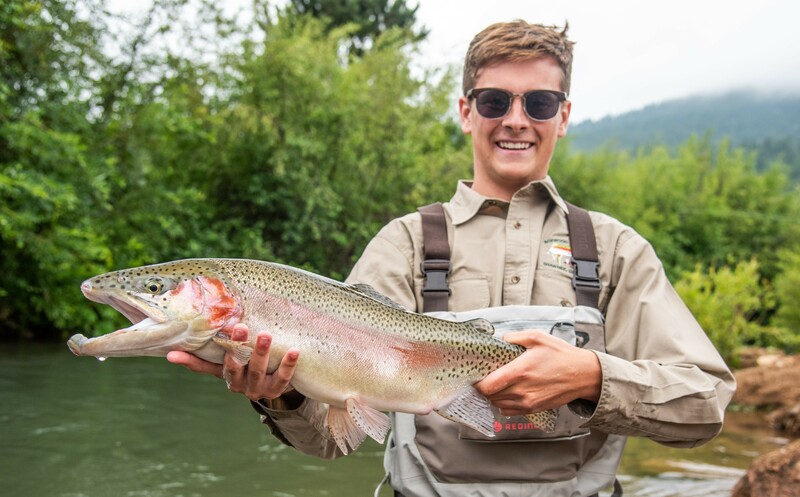 TRIP INCLUDES ACCESS TO PREMIER CATCH AND RELEASE TROUT WATER, PROFESSIONAL GUIDE, INSTRUCTION, ALL NECESSARY EQUIPMENT, AND A GRILLED LUNCH INSIDE BOXWOOD'S FAMOUS STREAM SIDE CLUBHOUSE! ALSO INCLUDED: ONE NIGHT'S LODGING AT BAILEY LODGE, LOCATED JUST MINUTES FROM BOXWOOD GULCH RANCH. WINNER WILL SELECT A DATE BETWEEN MAY 1 and AUGUST 30, 2020. DATES SUBJECT TO AVAILABILITY. *Note: One day Colorado fishing license not included. Transportation to property not included. Guide gratuity not included. Tally your additional entries by selecting the Boxwood Gulch social outlets you follow or will follow below. The official tally will be totaled before the winner is chosen. 1. No Purchase Necessary. Sweepstakes is open to any US resident age 18 or older. Employees, directors, and/or officers (including immediate family members or members of the household) of Boxwood Gulch, its subsidiaries, affiliated companies, distributors, advertising, fulfillment and promotion agencies and all other companies or entities associated with the Sweepstakes are not eligible to participate. Sweepstakes is void where prohibited or restricted by law. Participation constitutes entrant's full and unconditional agreement and acceptance of these Official Rules which are final. 2. Dates of Contest: The sweepstakes will start on 4/1/2019 and end on 5/1/2019. Winner will be notified on or around 5/6/2019 by the email provided at time of entry. 3. How to Enter. All entries, once submitted, become the property of Boxwood Gulch. Any incomplete entries will not be eligible. Filling out form above will grant an entry. Limited to one (1) e-mail address submission per person. 3.1 Additional entries for more chances to win. Entrant can receive 2 extra entries for each person that completes the form via the entrants shared referral link. Entrant can receive 2 extra entries by adding phone number for SMS push notifications. Entrant may receive 5 additional entries for following Boxwood Gulch on Twitter. Entrant may receive 5 additional entries for following Boxwood Gulch on Instagram. Entrant may receive 5 additional entries for following Boxwood Gulch on Facebook. Personal settings for each of these outlets must NOT be set as private as that may result in valid additional entries not counting towards the entrant’s total. Entrant can select that they have followed Boxwood Gulch social outlets on the entry landing page to tally their own entries. The official total of all entries will be shown on the date of the draw. 4. Winning. Boxwood Gulch shall select all winners at random by a computer generated system. Winners will be notified via e-mail used at time of entry. The odds of winning will depend on the number of eligible entries received. Boxwood Gulch will be responsible for all applicable shipping and handling fees. 5. Conditions. Prizes are non-transferable. Prize is a One Day Guided Fishing Trip with One Night of Lodging. No cash redemption or substitution will be allowed. If the prize is unavailable, Boxwood Gulch reserves the right to substitute a prize of equal or greater value. Boxwood Gulch also reserves the right to cancel or modify the sweepstakes or these Official Sweepstakes Rules if fraud, technical failures or any other factor beyond Boxwood Gulch's control impairs the integrity of this sweepstakes, as determined by Boxwood Gulch. By participating, where allowable by law, entrant grants to Boxwood Gulch the worldwide right to publish, broadcast and use in any media, including the internet, participant's entry, name, picture, and likeness, without limitation, for promotional and advertising purposes without additional compensation. Winner or winner's guardian may be required, in the sole discretion of Boxwood Gulch, to sign and return an affidavit of eligibility and a liability release within ten (10) days or the prize may be forfeited and awarded to an alternate winner. Automated entering of any kind is not allowed. Detection of said automated entering will lead to entries being voided. Only one registered account per entrant per 24 hours. If multiple accounts are detected for a single entrant their entries will be disqualified. 6. Liability. Each winner, by acceptance of the prize, agrees to release all Sponsors, their parent and subsidiary companies, their officers, directors, employees, agents, shareholders, affiliates, suppliers, distributors, and advertising agencies from all liability, claims, or actions of any kind whatsoever for injuries, damages, or losses to persons and property which may be sustained in connection with the receipt, ownership, or use of the prize. Mainstreethost and Boxwood Gulch are not responsible for Internet crashes or slowdowns caused by network congestion, Facebook errors or issues, viruses, sabotage, satellite failures, phone line failures, electrical outages, natural disasters or acts of man or God. This sweepstakes is not intended for gambling. If it is determined that a contestant is using the contest for gambling purposes they will be disqualified and reported to authorities. 7. Facebook is not a sponsor nor an affiliate of this sweepstakes. The information you provide, including name and contact information, will not be sold or distributed in any manner and will be used solely by Boxwood Gulch. Boxwood Gulch reserves the right to post winners names on their website, blogs, Facebook page, Instagram account, as well as any other media platform representing Boxwood Gulch. The winner will be notified 1 (one) time via the e-mail address provided in their entry form. Boxwood Gulch is not responsible for and shall not be liable for late, lost, misdirected, or unsuccessful efforts to notify potential winner. Winners must respond to the email sent within 10 (ten) business days of receiving it or prize will be forfeited and a new winner will be picked. The winner will be notified 1 (one) time via the e-mail address provided in their entry form. Boxwood Gulch is not responsible for and shall not be liable for late, lost, misdirected, or unsuccessful efforts to notify potential winner. By accepting and/or using prize, winner consents to the use of his/her name, voice and/or likeness for the purpose of advertising, trade, or promotion without further compensation, unless prohibited by law, and will provide such consent in writing upon request.